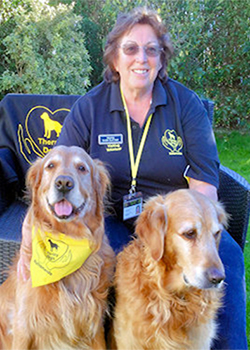 Once Eileen retired from 35 years working in Stockbroking and the Private Banking sector, she has devoted all her time to Therapy Dogs Nationwide. Eileen is a founder member of ‘TDN’ having volunteered for over 14 years with a previous charity. Eileen regularly visited hospitals, schools, and nursing homes. Her dog, ‘Cosmo’ has been doing Therapy work for over ten years, but recently retired from visiting schools and specializing in Phobic work with special needs young adults. ‘Spartacus’ is Eileen’s new companion and was Eileen’s retirement gift from her office colleagues at the Private Bank in Liverpool; Eileen preferring to buy a puppy to train up to be a Therapy dog rather than to have a gold watch which would sit in a drawer! ‘Spartacus’ now visits a mainstream primary school, where he does affection, mutism and touch issues with a small group of 7 year olds. ‘Spartacus’ will be transferring to the Special Needs School next year to take over ‘Cosmo’s’ role. Eileen can often be found giving talks about the work of our wonderful Charity as well as supporting our volunteers at their local events by popping up all around the country.